Services vary by location. Please click Find a Jiffy Lube® to see a full list of SUSPENSION services provided at your location. At Jiffy Lube® we continue to look at new maintenance services that consumers require and ones that we can offer with no appointment and so you can Drive in Drive on. Currently we offer this service at our St.Catharines Jiffy Lube location. The suspension in your vehicle not only helps to improve ride comfort, but also aids in proper vehicle handling. If you’ve been shaken from cloud nine with a lackluster performance it may be a key indicator that your suspension needs servicing. Is your vehicle suspension dipping and bottoming out when you go over bumps, bouncing as you drive and refusing to go in a straight line? If so, it’s time to tell your car to stop dancing around and get its suspension and steering in check! At Jiffy Lube®, we offer optimal steering and suspension services, helping you and your vehicle achieve a straight and smooth drive. Drive into a Jiffy Lube® today and have your suspension system inspected. Our trained Jiffy Lube® Technicians won’t steer your wrong. 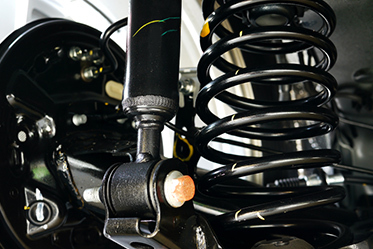 We will advise you of the condition of your shocks and/or struts and recommend a replacement service if necessary.